This is a display set which is why the price of this Titanium Yo-Yo is fairly affordable considering this high quality material yo-yo. This display set has no defect, however it does not have the actual premium square box. This yo-yo comes with strings, velvet pouch, and a plastic box. This is an unresponsive professional yo-yo. There are great materials of which a Yo-Yo can be made: wood, plastic, aluminum, etc. But undoubtedly, the best sensation is always obtained by Titanium. Do you already know what the Koreyoshi is made of? Titanium is a very hard and resistant material, and that is why it is the most suitable metal the manufacturing of Yo-Yos. However, it has a negative point. Its high cost is a great deterrent, both of manufacturing and of purchasing. 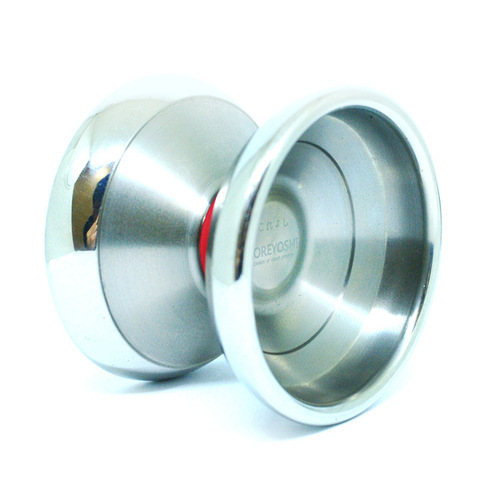 But in this occasion and just like Vosun always has, it surprises us again with a very accessible price for the Yo-Yo that is under scrutiny. The Koreyoshi attracts attention for its good services and effective design. 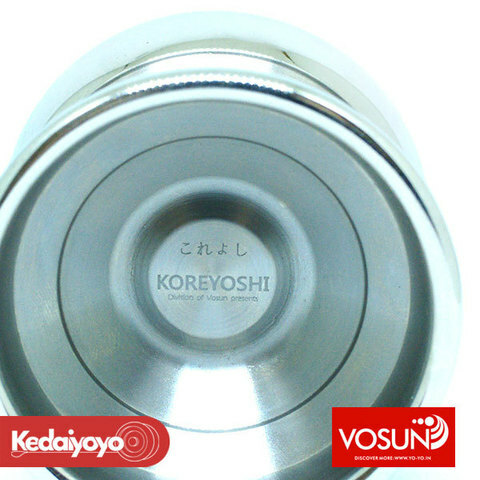 It is based on the first titanium Vosun Yo-Yo, the TiMe, but this Koreyoshi comes with rims more wide and a better apprehension area, to facilitate game faster and even horizontal styles. It looks like a Bi-Metal but it is not. It does not take chrome rings like many of you all will be wondering. It is the proper polished Titanium that shines so much in the rims: It is beautiful! 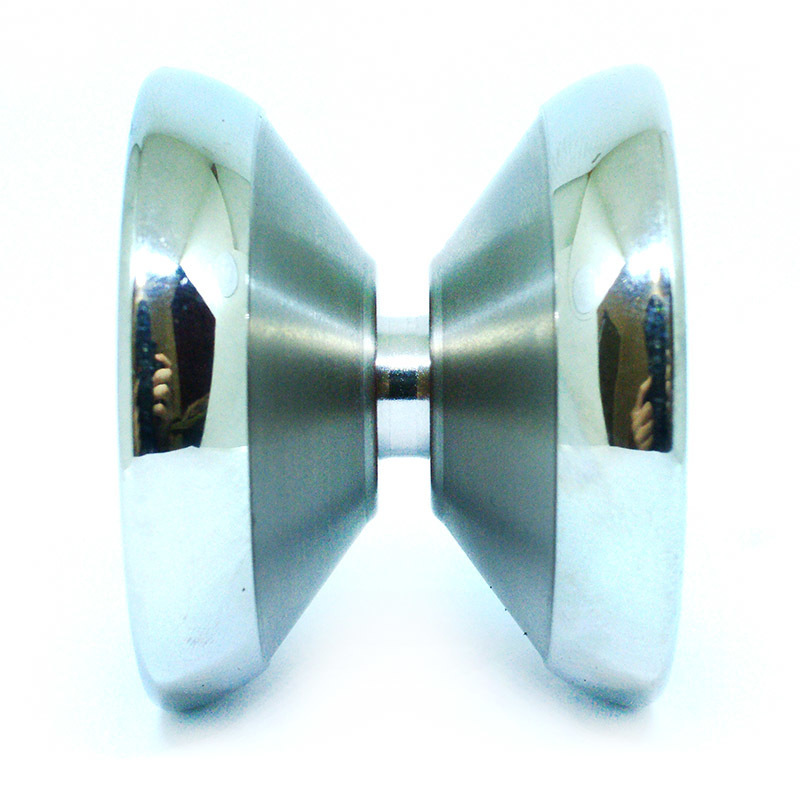 In our opinion the combination of the dull Titanium of the body and the polished Titanium is beautiful. The Yo-Yo always obtains a special sheen while you play with it, and that is where it gets most of its attention. But let's get to the important thing. How does it play? Brilliant, would be the word. It has not, is not, and will not be beaten. The Koreyoshi feels very light on the string, and simultaneously very widely, therefore the sensation of stability unreal. One notices that it takes fair amount of weight in the rims to stabilize it during the game, although it also helps to have a V-Shape that pushes the forces towards the exterior, concentrating all the weight on the ends when the Yo-Yo spins. One notices that the natural habitat of the Koreyoshi is competition. But there is still a thing that we have not mentioned and we love. We speak about its response system. Vosun has calculated and perfected the hardness of the silicone pads that the Koreyoshi incorporates, because with every bind, the string chatters perfectly and whenever you throw, it is unrolled perfectly until the end of the string. Vosun is living proof that a great Yo-Yo doesn’t have to cost you an arm and a leg!